Two or three times a week, our dining room table turns into a giant art project. We cover the table with paper, crayons, markers, safety scissors, glue, watercolor paints, and other items and our children get down to the important business of creating something. One time, it might be paper snowflakes. The next time, they’ll draw a giant alien landscape with a purple sun, blue trees, and red-skinned aliens with huge black eyes and long spider-like legs. The next time, decorated paper airplanes. After that, a detailed family portrait. You get the idea. The only problem with this is that having enough paper to handle all of these projects can really add up. We could easily buy paper by the ream for our children to use in these projects. Thankfully, there’s a much cheaper solution: an end roll of newspaper. 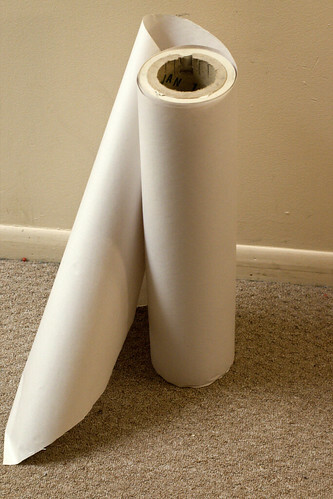 A newspaper end roll is a giant roll of blank newspaper with most of the paper removed from it, leaving “only” hundreds of square feet of blank newspaper behind. When newspaper printers make the newspapers that people read, the blank newspaper comes on enormous rolls. These rolls are placed on a machine and during the printing process paper is pulled off of these rolls (think toilet paper in the bathroom), the articles you read are printed on them, and then the paper is cut to an appropriate size by a cutter. It takes some effort to change these giant rolls of paper, so if the daily run has ended and a roll doesn’t have enough paper on it to handle tomorrow’s run, most newspapers will take off the partially used roll and put a new roll on the machine. They then take those partially used rolls into their office and sell them to the public to recoup some of the cost. This is where I entered the picture. I walked into my local newspaper office, dropped two bucks on the counter, and walked out with an end roll of newspaper. The roll still has thousands of square feet of blank newspaper on it, perfect for the art needs of a six year old and a four year old. It’s perfect for making paper snowflakes, giant landscapes and murals, paper airplanes, paper masks, paper crowns, paper maiche sculptures… the list goes on and on and on and on. We often cover a large portion of our table with blank newspaper when engaging in art projects. The children (and sometimes the adults) will collaborate in drawing a giant picture, then we’ll hang it up somewhere for a week or two. Or we’ll cut out large squares of paper and make paper airplanes to fly around the house. Or we’ll turn it into paper maiche and sculpt something (we wrapped it around a balloon last year to make a helmet, for example). The possibilities are endless, and for only a dollar or two, it’s a really good deal. You’ll likely have enough newspaper on that end roll to use until your children have completely outgrown kitchen table art projects. Not only that, you can use the blank newspaper for other purposes, such as wrapping gifts. We wrapped several items in newsprint this winter, with all of us drawing Christmas trees and candy canes all over the packages. An end roll is an incredible bargain, particularly if your children are even remotely interested in art.